H and S hired me at the end of the second trimester of their fourth pregnancy. H had a history of preterm delivery and medically managed births and was wanting a different experience this time. After research and encouragement from me, H began progesterone injections soon after starting care with me to help lower her chances of preterm labor. Pregnancy progressed along normally. We were all ecstatic when H hit 36 weeks, the most she has ever been pregnant, and all stayed quiet with her uterus. It seemed like her body and baby were going to hang on to make it to 37 weeks, the golden period to make in order to have a home birth. In the morning of August 19 (at 37.1 weeks), H sent me a text saying her labor waves felt differently that morning and when she timed were coming every 3-5 minutes. She was going to treat as if it was prodromal labor and focus on baths and hydrating. I was seeing patients all day so we agreed to stay in close contact. Things continued the same through out the day. I had to do a two day postpartum home visit that night. While there, S called and talked about what H was feeling. We decided it would be a good idea for me to stop by on my way home and do an exam and see what was going on. I arrived at 1015pm and chatted with H about how she was feeling. We did an exam at 1040pm and found her cervix to be dilated to 6cm, 100% effaced and baby was at a 0 station. H agreed to a membrane sweep to see if it would intensify and strengthen the contractions. I requested H go for a walk after the sweep, and I would stick around to see how things felt after the walk. H and S got back around 2335 and she stated the labor waves felt stronger. I decided I would stay since it appeared H was in active labor. I did vitals and H ate a meal before deciding to lay down and rest for an hour while listening to her hypnobabies tracts. A little after 1am, H was up. I suggested doing the lift and tuck for ten contractions to help baby’s position and to intensify things. Contractions started coming every 3 minutes, lasting 60 seconds and seemed moderate in intensity. H walked around the living room for a few waves, then alternated sitting on her birth ball and hands and knees. She did a great job of being in tune with what felt good to her body. S was right at her side, encouraging and supporting her. H requested a cervical exam around 230am. She was now 7cm. We began using a tincture to help strengthen the contractions. H told a story about her mother and how she belly danced through all her labors before going to the hospital. H’s sisters and I began to encourage her to belly dance to help strengthen the contractions and help move baby down. H was apprehensive at first but began looking on You Tube for the right belly dancing music. After she found the right music, she began to alternate belly dancing into her positions she was trying. It was beautiful to watch, and the labor waves strengthened as she danced. H would push herself to keep dancing when waves came on her. It was magnificent. When H was tired from belly dancing, she would sit and rock on her birth ball or lay on her side on the couch and listen to her tracks to refocus for a few minutes. As 5am neared, contractions were coming every 4 minutes, lasting 60 seconds long. H was feeling tired and feeling like things were taking so long. She decided she wanted to lay down and try to nap and listen to her hypnobabies tracts. H asked me to do an exam at 545am. I found her cervix hadn’t changed. H was feeling discouraged about the lack of cervical progress in her labor journey. I encouraged her that she was doing well, and the no one was in a hurry. We discussed options of doing more herbs, resting and breaking her water, since it was very bulgy and seemed to potentially be keeping things at a lull. H felt unsure. I encouraged her to continue to rest and listen to her tracts and if she wanted to try something we could do that when she was ready. H rested until 7am. She walked around the living room and asked me if I would do another exam. Everything felt the same. H and S said they would like to go ahead and break the bag of water. We made sure the birth pool was warmed and ready as H anticipated wanting to move right into the birth pool. At 715am I broke the bag of waters. Baby sounded great through out. A few minutes later, H got on her knees in the warm birth pool. Around 730am, H said she was feeling light headed. We all were a bit in a scramble to figure out what the issue was and how to best support. Someone gave H a spoonful of honey and someone else had her smell peppermint oil. H kept telling me I better not take her to the hospital and that she feels this way sometimes. She asked someone for an ice pack. I did a quick exam to see if delivery was close and causing the issue and felt the nerve that was causing her to feel light headed. H directed my hand to where she wanted pressure. I put a good amount of weight into counter pressure on her back which seemed to take away the light headed feelings. At 752am H began spontaneously bearing down at the peaks of the contractions, and she requested her sisters to put on her “deepening” hypnobabies tract. She began to spontaneously bear down fully with waves at 757am, and the head was visible on the perineum. I knew they wanted S to catch the baby so we tried getting one of her sisters to help support her arms so that S could catch but there was no time. This little one was in a hurry! His head was crowning one minute later and the next minute, H brought her sweet baby into the world and into her waiting arms. Welcome to the world Stephen IV, born earthside on August 20, 2016 at 759am, weighing in at 7.0#, 20 inches long. 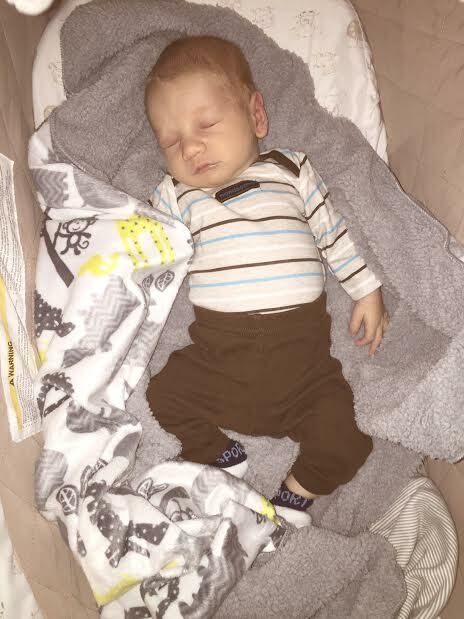 His mama worked so hard through so much full body preparation over the weeks to get to term and birth her sweet boy the way she envisioned and planned. It was such a joy to support this sweet family in welcoming their fourth baby and first son into the world!